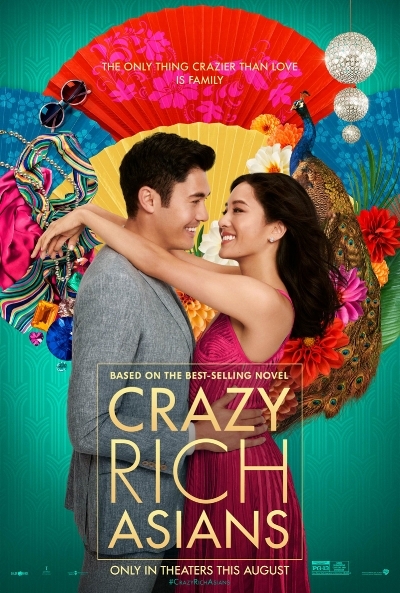 Movie poster for Crazy Rich Asians (2018) starring Henry Golding and Constance Wu. In honor of Asian Pacific American Heritage Month in May, it is worth examining Asian American representation in recent films and television shows. As the fastest growing racial/ethnic group in the U.S., Asian Americans currently make up 6% of the population and are projected to account for 38% of all American immigrants in 50 years. Yet they have remained virtually absent from mainstream entertainment until recently. On August 17, Crazy Rich Asians will be released; it’s the first major Hollywood production that is not a period piece to feature an all-Asian cast in twenty-five years (since The Joy Luck Club in 1993). Adapted from Kevin Kwan’s 2013 bestselling novel, Crazy Rich Asians is a romantic comedy about a Singaporean heir who brings his Chinese-American girlfriend home to meet his family. The film arrives at a time when the entertainment industry is hotly debating the issue of diversity. The film market in China is second only to the U.S., but despite that nation’s box office contribution, very few major American films feature Asian characters. According to a study by the University of Southern California, only 5% of speaking parts in film, television, and digital programming were played by Asian actors in 2014. Moreover, whitewashing – hiring white actors to play characters originally designated Asian – still occurs. Scarlett Johansson was cast as Motoko Kusanagi in Ghost in the Shell (2017), a live-action Hollywood remake of one of the most successful Japanese anime movies in history. Other examples of recent whitewashing and erasure of Asian actors include Emma Stone playing a part-Chinese, part-Hawaiian character named “Allison Ng” in Cameron Crowe’s Aloha (2016); Matt Damon in the starring role of a big-budget Chinese period action film The Great Wall (2016); Tilda Swinton as the Ancient One, a Tibetan high priest in the original comics but reimagined as a Celtic mystic for Marvel’s Doctor Strange (2016); and white-dominated Hollywood versions of Asian stories such as The Last Airbender (2010) and Dragon Ball Evolution (2009). A multi-university group of California professors and scholars studied 242 TV shows and 2,052 series regulars from broadcast, cable, and streaming television scripted shows airing between September 1, 2015 and August 31, 2016. Their report, a follow-up to broadcast TV studies done in 2005 and 2006, concluded that although there are more opportunities for Asian-American and Pacific Islander (AAPI) actors than before, their characters remain marginalized and tokenized on screen. Roles are often of lower quality: characters get less screen time, have less meaningful interactions (including less romantic storylines), or are clearly cast as tokens. Despite the minimum amount of progress for AAPI actors, strides have been made. On the small screen, Asian-American-led TV shows are on the rise. For example, ABC’s Fresh Off the Boat has a predominantly Asian-American cast. Inspired by celebrity chef Eddie Huang’s memoir of the same name, the sitcom follows a Taiwanese-American family that moves to Orlando in the 1990s. The show features an oldest son who loves hip-hop and misadventures, with his parents dishing out moral lectures with uniquely Asian-American points of view. Since Margaret Cho’s All American Girl was cancelled in 1995 (after one season), there hadn’t been a primarily Asian-American cast on network television for twenty years. Currently, Fresh Off the Boat is the only show with an Asian-American-majority cast on network television. Dr. Ken – an ABC show about a Korean-American physician with no bedside manner, his Japanese-American therapist wife, and their two kids – was cancelled in 2017. 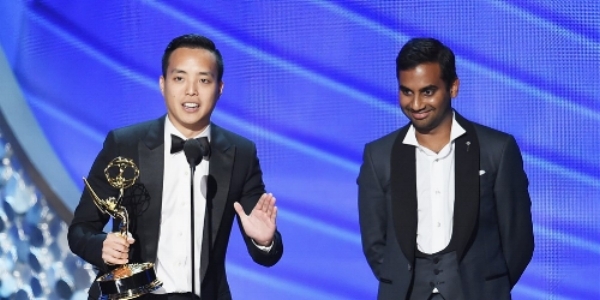 Actor/writer Aziz Ansari (R) and writer Alan Yang (L) accept the award for Outstanding Writing for a Comedy Series for the Master of None episode “Parents” during the 68th Annual Primetime Emmy Awards on September 18, 2016. Critics have praised two shows with three-dimensional Asian-American leads that go beyond Asian stereotypes. Netflix’s Emmy-winning Master of None – the story of a struggling Indian-American actor in New York told through a distinct, unexpected storytelling lens – features Aziz Ansari essentially playing a version of himself. And HBO’s Emmy-nominated limited series The Night Of, starring Riz Ahmed, follows a nice guy in the wrong place at the wrong time, who ends up accused of murder and imprisoned. The show dives deep into identity politics, the perception of Pakistanis, and the legal system to explore how a strong-willed, moral man can be transformed and turn bad. In addition, recent shows like The Walking Dead, Quantico, The Good Place, My Crazy Ex-Girlfriend, Designated Survivor, Into the Badlands, Agents of SHIELD, The Mindy Project, and Andi Mack have featured Asian-American actors as the lead or regular cast member. The decades-long absence of leading Asian-American actors seems to be on the brink of a major shift. Jennifer Liu is an Associate Professor of History at Central Michigan University. Her research interest focuses on twentieth-century China and Taiwan.